"Rahul Baba (Gandhi) should stop daydreaming. Congress is at such a position that it would (soon) be difficult to find them with binoculars. Neither the country nor Rajasthan is secure in their (Congress) hands," Amit Shah said. BJP president Amit Shah on Wednesday asked Congress president Rahul Gandhi to stop daydreaming about coming to power in the upcoming elections. Addressing party workers in Dhankya, nearly 35 km from Rajasthan's capital, Mr Shah predicted a speedy decline of the Congress from mainstream politics. The BJP president said, "Rahul Baba (Gandhi) should stop daydreaming. Congress is at such a position that it would (soon) be difficult to find them with binoculars. Neither the country nor Rajasthan is secure in their (Congress) hands." 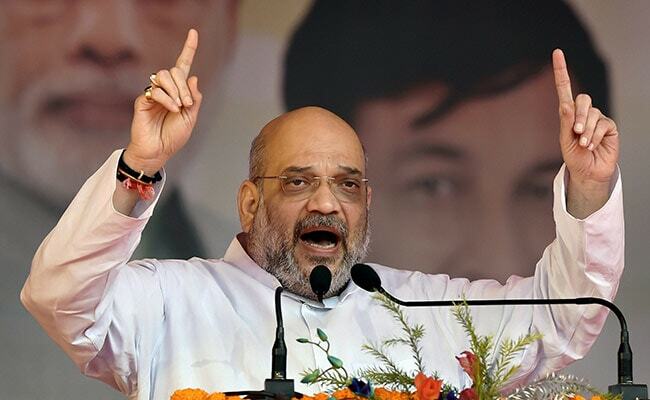 Recalling the recent successes of the BJP in state elections, Mr Shah said Mr Gandhi should analyse why the Congress tasted defeat in elections after Narendra Modi-led BJP government came to power in the centre. In a mythological reference, the BJP president compared the BJP to 'Angad's foot' as no one could dislodge them (the BJP) in Rajasthan or even the centre just as no one including Ravana could move Angad's foot in Hindu epic Ramayana. Mr Shah hit out at the Congress president for seeking an account of work done by the BJP-led NDA government at the centre in the past four-and-a-half years, saying the people of the country want to know what four generations of his family had done for them. He said the centre had provided over Rs 2.63 lakh crore to Rajasthan during its tenure, whereas Congress despite having governments in the state and Centre provided only Rs 1.09 lakh crore. "We have not done any favours to the people but have given them their rights and you (Gandhi) are seeking an account from us. First, finalise your leader under whom you want to contest elections in Rajasthan," Mr Shah said. Mr Shah attacked the Congress on the issues of National Register of Citizens (NRC) in Assam and surgical strike. Mr Shah said human rights of Indian youths were more important than the interests of intruders. "We will identify the intruders and evict them one by one," he said. He further accused the Congress of caring only for the vote bank. Exuding confidence in party workers, Mr Shah said it was not an election of any minister or chief minister but it was an election of party workers and the BJP. Party workers should think only about the party symbol 'Lotus' and 'Bharat Mata' (Mother India) when they are campaigning, he said at the event. He urged the party workers to end the custom of alternate governments in Rajasthan. He said this tradition will end and the lotus will bloom in the state for the next 50 years.